Joel Skousen is a nephew the epistemic trainwreck W. Cleon Skousen. W. Cleon, as you may remember, was a professor at Brigham Young University and a neo-Confederate, unapologetic racist and Mormon young earth creationist (a series of books) whose (absolutely incoherently insane) book The Five Thousand Year Leap became a recent bestseller after being heavily promoted by Skousen’s intellectual heir Glenn Beck – it is, by 2014, still used in at least one publicly-funded charter school, Heritage Academy in Mesa, Arizona. Among his other books The Naked Communist and The Naked Capitalist were popular in John Birch Society groups and portrayed communism as a conspiracy among wealthy capitalist families such as the Rockefellers to assume control over the world. It all gives you an idea of the intellectual climate that bred his nephew Joel. Joel Skousen has made a career among survivalist idiots. He currently runs a couple survivalist retreats, and has written instructions on building fall-out shelters as well as several books. “You never want to make a house look like an obvious fortress,” says Skousen: “Those who want in can always move up a bigger gun. There is no way you can design a home to withstand RPG rockets and tanks. I design these homes so you virtually cannot tell inside or out that they are any different from a conventional home.” He is also considered an expert by some in what he calls “strategic relocation;” because of its low population density and diverse economy, Skousen (in line with e.g. survivalist writer James Wesley Rawles) recommend the Intermountain west region of the United States, as a preferred region for relocation and setting up survival retreats. 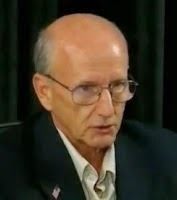 “More than ever, I still consider the nuclear attack on America as inevitable, both because the real axis of evil (Russia and China) are still building for that attack, and because our own government is controlled by those intent upon destroying US sovereignty and delivering our nation over to a socialist New World Order,” says Joel Skousen. Why isn’t this attitude reflected in the beliefs of most Americans? “The one thing you can learn from the liberal and controlled media […] is the direction in which the conspiracy against liberty is going. […] When they start uniformly promoting certain issues in all the liberal journals (global warming, smart growth, gun control, etc. ), it is obvious that there is some coordination going on.” In other words, consensus is proof of a conspiracy – though only when the consensus disagrees with Skousen, of course. “But remember, you can only learn to see through the selectively filtered news dispensed by the establishment media if you have other sources that feed you the missing pieces,” i.e. if you selectively choose to listen only to those denialists and lunatics who already agree with you. He eloquently describes the future destruction of America in World War 3 after the year 2020 after an economic collapse here; apparently America is arming Israel, China, Russia and other nations with the latest military technology while America disarms and deindustrializes its own infrastructure. It also includes a map of “likely nuclear targets” and, for some reason, active volcanoes. In the 2008 election Skousen backed the Constitution Party’s Chuck Baldwin, which should be enough to warrant an entry on its own. Worthy, perhaps, of mention is Joel’s brother Mark Skousen. Mark is an Austrian school economist, gold bug and what can only be deemed a Federal Reserve conspiracy theorist. He has written multiple books published by Regnery Publishing and articles and is sometimes recognized as an authority in libertarian circles. His main qualification for our purposes, however, may be his involvement in arranging FreedomFest, which is to a large extent a cesspool of conspiracy theory and quackery mongering. Cleon ain't so bad, yes into conspiracy, and making predictions. I reckon you could also say the large investment firms are into conspiracy, as well as making predictions. I know one thing to be unopposedly true, chance favors the prepared. I read all I can, from all angles.